Note: spatial selection only works with database layers, not with files. If you want perform spatial queries please import the files into the database first. Also, make sure that multigeometry is exploded into the geometry. 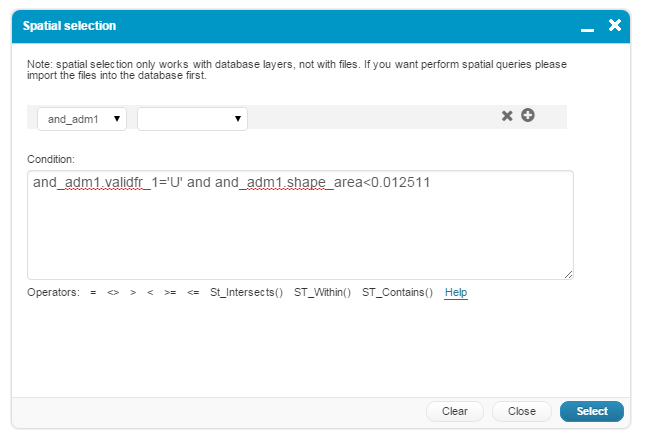 Spatial selection allows you to create database queries for layers that reside in the database. 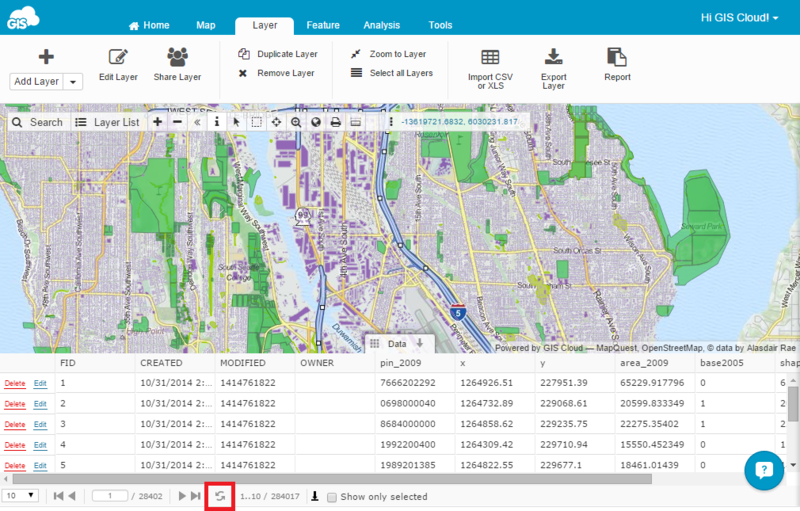 This tool allows you to select any database feature from any database layer in your Map View. You can select features by attributes or by location depending on what do you need. 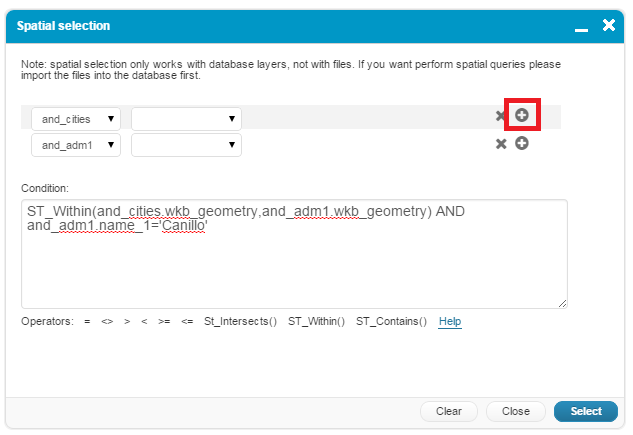 For information how to make basic spatial selection queries, click here. To perform Spatial Selection on tutorial data click here to open map in the Map Viewer. Example 1. Select town with population 5000. Click Feature tab and Spatial Selection icon. Select table and_cities and column number. Example 2. Select town with the name Andorra la Vella. Select layer and_adm1 and column name_1. Write (don’t copy and paste) =’Andorra la Vella’. Note: attributes are case sensitive. 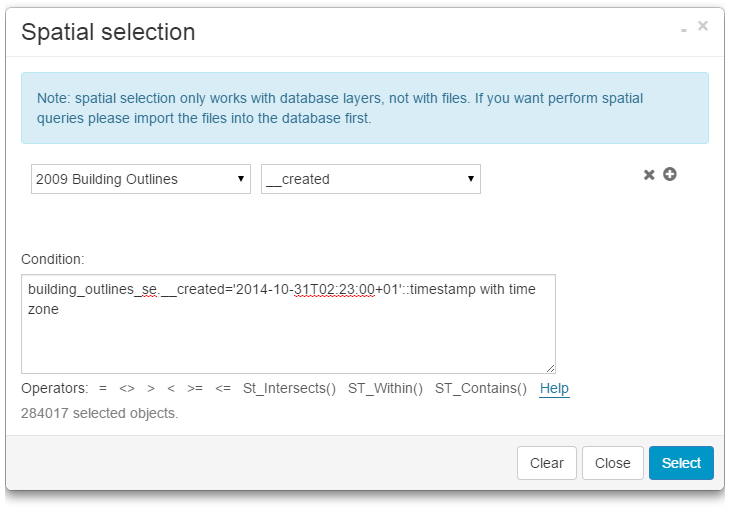 Note: Make sure that you put single quotes (i.e.’giscloud’) for String (text) attributes. Example 3. Select counties that belong to the ‘U’ zone have and area less then 0.012511. 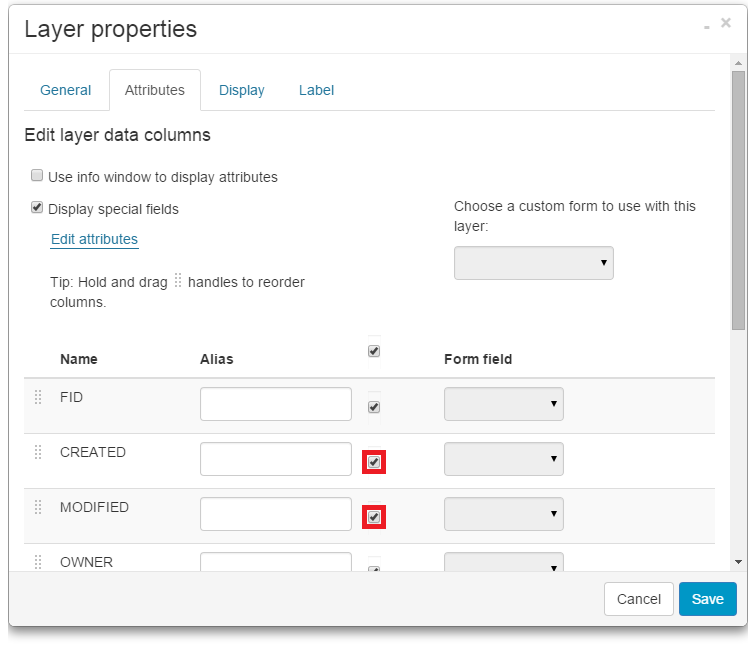 Select layer and_adm1 and column validfr_1. Write (don’t copy and paste) =’U’. Select layer and_adm1 and column shape_area. Example 4. Select both primary and secondary routes. Select layer roads and column rtt_descri. Write (don’t copy and paste) =’Primary Route’. 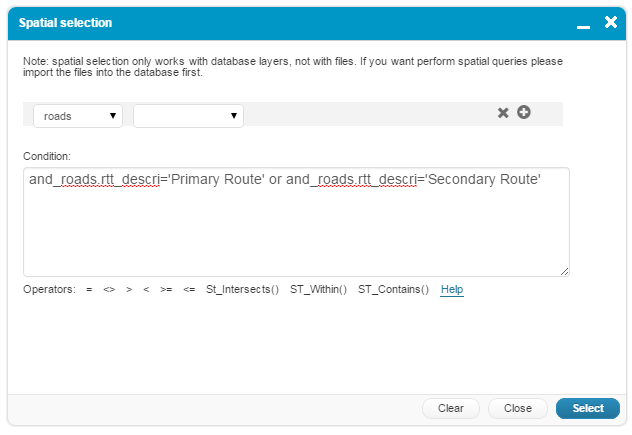 Again select layer roads and column rtt_descri. Write (don’t copy and paste) =’Secondary Route’. Example 5. Select towns inside Canillo county. Select and_cities and wkb_geometry column. Note: to add another table click “+” button. Select layer and_adm1 and column wkb_geometry. Select and_adm1 and name_1 column. Write (don’t copy and paste) =’Canillo’. Note: wkb_geometry field has information about geometry in the binary form. Example 6. Select roads that intesect Andorra la Vella county. Select layer and_roads and column wkb_geometry. Click + to add another table. CREATED and MODIFIED fields are automatically generated fields with information about when is feature created and last edited. Click on a layer in the Layer list. Open Layer tab and Edit layer button. Check CREATED and/or MODIFIED checkbox. Make sure that you type ::timestamp with time zone. Open Spatial Selection window from the Feature tab. Select your layer and column _created from the dropdown menu. Write time and date in the previously described way =’2014-10-31T00:02:23+01′::timestamp with time zone. Write time and date in the previously described way ‘2014-10-20T02:00:00+01’::timestamp with time zone. Select again layer and column _created and write < operator. Write time and date in the previously described way ‘2014-10-31T05:00:00+01’::timestamp with time zone.